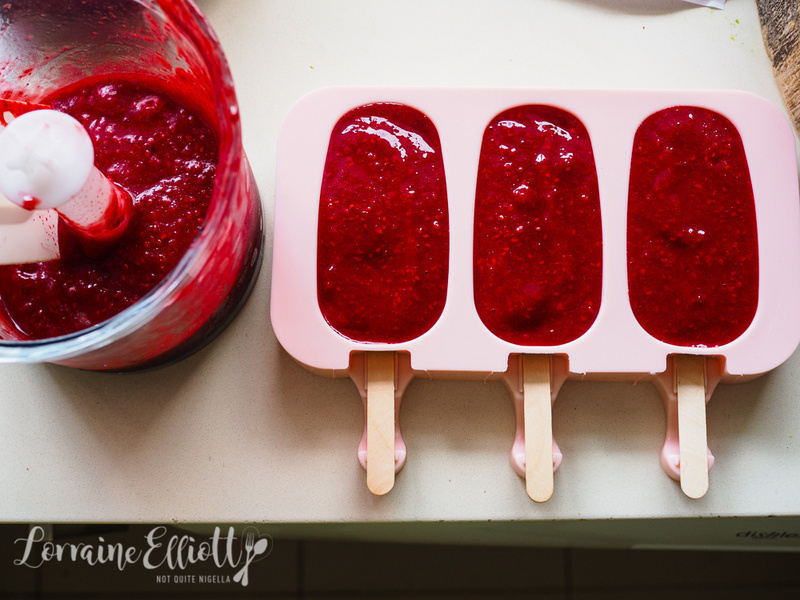 Cool Down With These Raspberry Daiquiri Popsicle Cocktails! 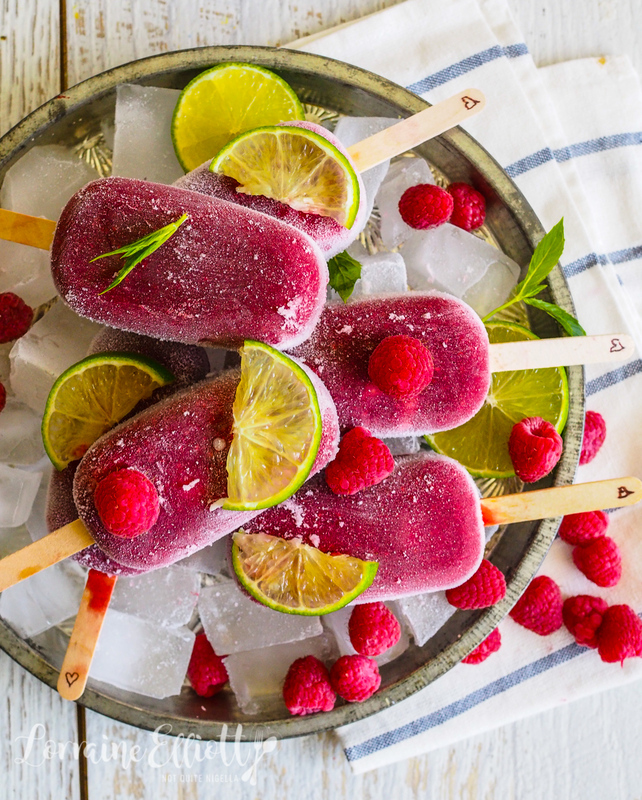 Summer is back for one last hurrah and when it's hot, there's nothing better than an icy cold cocktail popsicle. 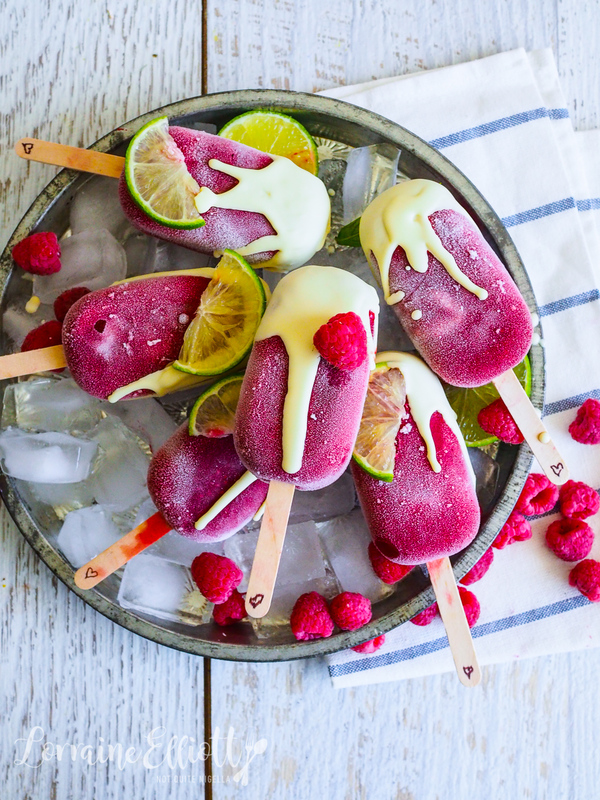 This raspberry daiquiri ice block takes 5 minutes prep and its touch of zesty raspberries, lime and hit of rum will cool you down in no time! I made these in preparation for the unexpected hot spell. 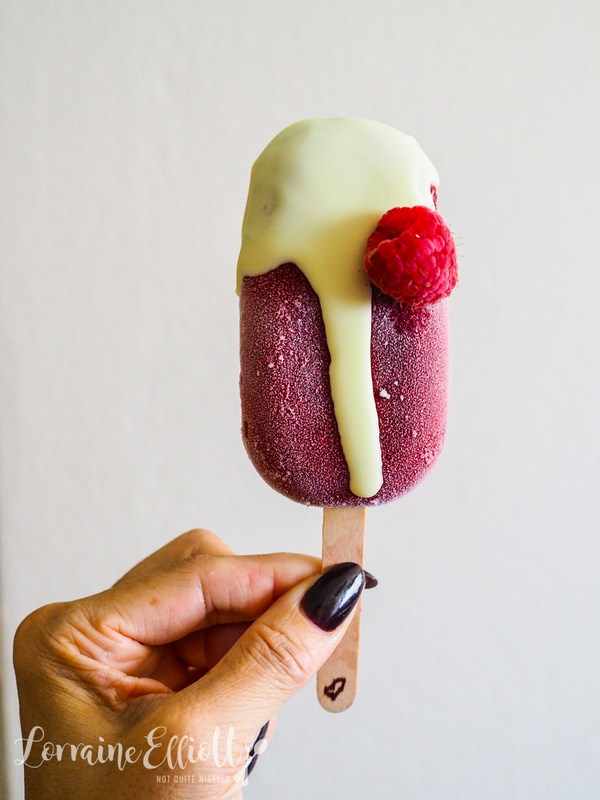 I had lots of fresh raspberries and I used a lot of them but I wrote frozen in the recipe below because fresh raspberries are normally a bit too expensive to puree and freeze. A daiquiri usually requires sugar syrup. I'm not sure about you but if I see it as an ingredient it gives me pause. Nobody has time to make sugar syrup. I mean sure I have the time and inclination to make a four layer cake but sugar syrup? No thanks. So I subbed it for icing sugar which works just as well. I also added an optional layer of white chocolate on top because I love creamy and fruity combos. I have to admit that I really fell for these. Yesterday was also pretty warm and in the name of research I ate two of these. Mr NQN had to warn me that we were about to go to lunch and that these had a bit of alcohol in them (and I'm a very cheap drunk, 1/4 of a cocktail and I'm gone). I looked at him straight in the eyes while picking up the second one and said in a low, furtive voice, "I do what I want...". I mean nobody can tell me what to do and it was very apparent when I was eating these ice blocks. It was a phrase I picked up from Ivy. Admittedly she was more talking about her vintage sausage dog Mimi who has a mind of her own and is the boss of the sausage dog clan. But I figured that it applied to me too. And you know what? He never mentioned it again. So tell me Dear Reader, is there a phrase that applies to your life? Do you always do what you want? And would you add the white chocolate layer on these or not? Step 1 - Place icing sugar in a food processor and blitz until the lumps disappear. Blend this with the remaining ingredients. Pour into molds and freeze. Step 2 - Option: melt the white chocolate and mix with the coconut oil and drizzle it on top of the ice blocks. recipeStay Cool With Easy Lychee Ice Cream! recipeHow To Stay Cool With Mojito Ice Block Popsicles! recipeUnFried Ice Cream With Butterscotch Sauce! recipeDon't Stop Believing - Unicorn Rocky Road! recipeIngenious S'moreos - Not S'mores but S'moreOs! recipe Stay Cool With Easy Lychee Ice Cream! 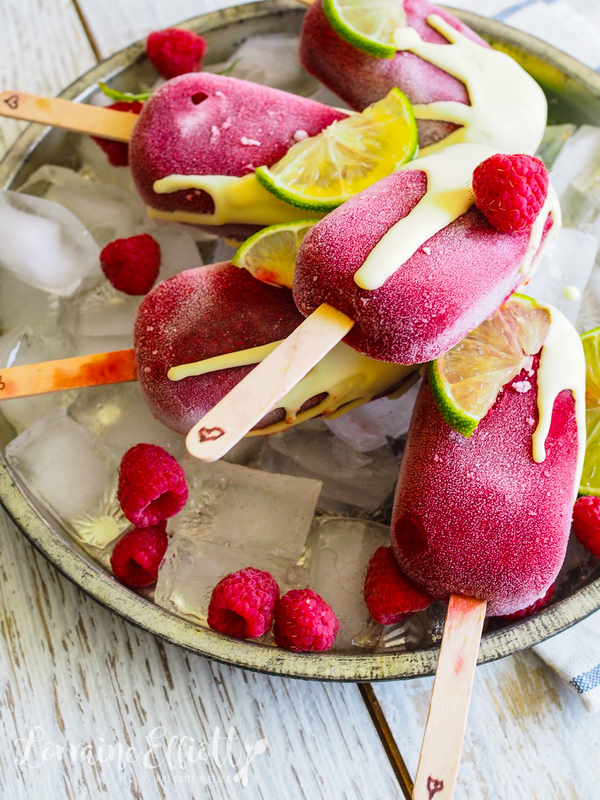 recipe How To Stay Cool With Mojito Ice Block Popsicles! recipe UnFried Ice Cream With Butterscotch Sauce! recipe Don't Stop Believing - Unicorn Rocky Road! recipe Ingenious S'moreos - Not S'mores but S'moreOs!